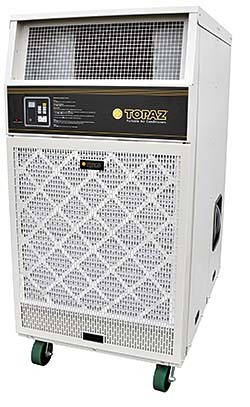 The Topaz TZ-60B is a redesigned portable air conditioner. Designed for portability and durability, the unit is constructed of powder-coated steel. The unit offers 75,900 Btu per hour of cooling and can provide heat with a built-in electric heat coil. Other new features include: a digital, programmable thermostat; easier service access; and a built-in condensate pump. Power options include 208-230V/1Ph, 208-230V/3Ph, and 460V/3Ph.